A little two-game losing streak isn’t keeping our group of football “experts” from once again picking the Eagles to soar to victory. This week percent 75 percent have the Eagles beating the 49ers at the Linc Sunday. Football Night in Philly's Howard Eskin says this is a "stone cold mortal lock -- no question Eagles win!" The pro-Birds charge is led Glenn “Hurricane” Schwartz who has some interesting analysis on why the 1-2 Eagles should be motivated to play better against the 2-1 Niners. Hurricane sees a 31-17 Eagles win. Social media guy Lou and newsdesk guy Franco both have the Eagles winning 24-13 in a must-win situation. Reporter Tim Furlong has a bit more of a positive point of view while picking the Birds to win. Birds Nest blogger Brian Solomon sees a slightly lower scoring game as the Eagles come out on top 20-13. “The Vick offense sputters, but Alex Smith and the 49ers can't get anything going against the relentless Philly pass rush,” Brian said. As for me I’m in the Hurricane train of thought. The Niners are better than in recent history thanks to Jim Harbaugh taking over as head coach but they still have an aged Frank Gore at running back and an average at best QB in Alex Smith. Expect the Eagles defense to finally break out this game -- I’m calling for at least four turnovers forced by gang green. Yes, my fellow Terp, TE Vernon Davis, will go wild on the Eagles beleaguered linebacking corps but his 100-plus yards won’t be enough as the Eagles win 34-16. I see another 100-plus yard game from Shady McCoy helping the Eagles to a big win. 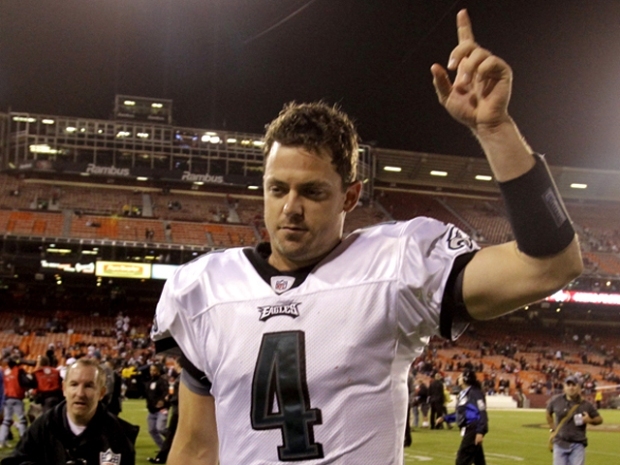 And three field goals from David Akers in his return to Philly. Fellow Birds Nest blogger Drew Magary leads those picking San Fran. “I’m hard-pressed to pick the Eagles when I have NO faith that Vick will be able to finish this game,” Drew said while picking the Niners to win 14-13. And let’s not forget sales guy Corey.I called him a “sourpuss” for picking the Giants last week but he was the only expert to correctly pick against the Birds last week. This week he keeps up picking the enemy over the Birds as the 49ers win 23-20 thanks to a familiar face to Eagles fans. What do you think out there? Will the Eagles get back on the winning track this week?